Latest news:I completed the 48km race last Saturday in excellent track conditions, setting my personal best after only about 24 years of on and off trying. I finally cracked the three hour barrier! In fact, I smashed it, slashing more than 26 minutes off my personal best! Over the last few months I have concentrated my focus on nutritionally supporting my adrenals and thyroid, using the skills and experience I have gained as a clinician in the treatment of thyroid and adrenal disorders. Gosh - it is so effective, especially for older athletes! My PB was 2hrs 12min. Only one 60 year old has ever broken three hours in the 30 year history of the race (The legendary Peter Reynolds in 2013 in a time of 2hr 55min). Well, I reduced the record to 2hr 46min 44s. That's staggering. And I did it the easiest ever- not a single cramp - Just a badly bruised knee from a wee spill down the Rock Garden (Caused by other riders putting me off my line though the rocks). I know I can go faster. My goal has been to be one of the fittest 60 year olds anywhere and I think I am well on the way to achieving that. I have chosen mountain biking for a number of reasons: I really enjoy it; it is intense and brutal (especially when you fall off) and it requires skills such as precise balance and lightening fast reactions - all of which deteriorate as we get older. Well, I have set out to prove that its not all downhill from 30 years - We can still bounce well at 60! How did I manage to make such a spectacular reduction in my times despite now being in my early 60's. Well it was not from doing more and more training - doing that is futile unless the body can handle the stress and respond in a positive, anabolic manner. Everything we have been told about the ageing process is that the body progressively weakens along with its capacity to heal and to respond to stress. That is true; but does it actually have to be? How much of ageing is due to uncontrollable degradation and how much of what we think is ageing is due to things that are within our control, such as nutritional deficiencies and imbalances and reversible scarring of tissues? The end result is that my ability to train and my response to training is estimated to be on a par with where I once was in my 20's. How can I say that -To make such an outrageous claim? Well I don't have to: The performances say it all! I have had at least a 30% gain in performance over the previous 10 years; despite all that we know about ageing and the inevitable decline in performance. Better than Lance, if I may so so! For about the last 20 years, I have been trying to break the magical 3hr barrier for the Karapoti Race (Refer to the article below for more about Karapoti). My success has been less than glorious with my best a frustrating 3hr 12min - so far. Is time running out, since I am a lot older than when I made my first attempt? I don't think so. My Karapoti goal this year, as a 60 year old, is not just to break 3hrs, but to break the 60 plus record of 2hr 55m. And I am confident that it can be done. In fact, I will be aiming for 2hr 50. This summer has been one of fantastic successes on the bike and in duathlon, with several victories that have me way ahead of any other 60 year old athletes - so far. Currently, I am ranked 2nd in the 50+ age category in NZ Mountain Biking Crown and finished 4th in the NZ championships, less than 1 second behind 3rd. Calculating the difference between myself and the overall age group champion, Ian Paintin, who also happens to hold the 50+ record for Karapoti (2hr 42), I can work out what time I should be able to do Karapoti this year. Which works out to be about 2hr 50m or less. However, the current 60+ record holder, the legendary Peter Reynolds, is competing again this year and he is not about to let me spoil his party. I have heard rumours that he has been training hard and even upgraded to a new bike. He will be aiming to be the first Old Fart to break 2hr 50, I suspect. That will be really something! But my plan is to have my nose in front. We will know the result by tomorrow midday. 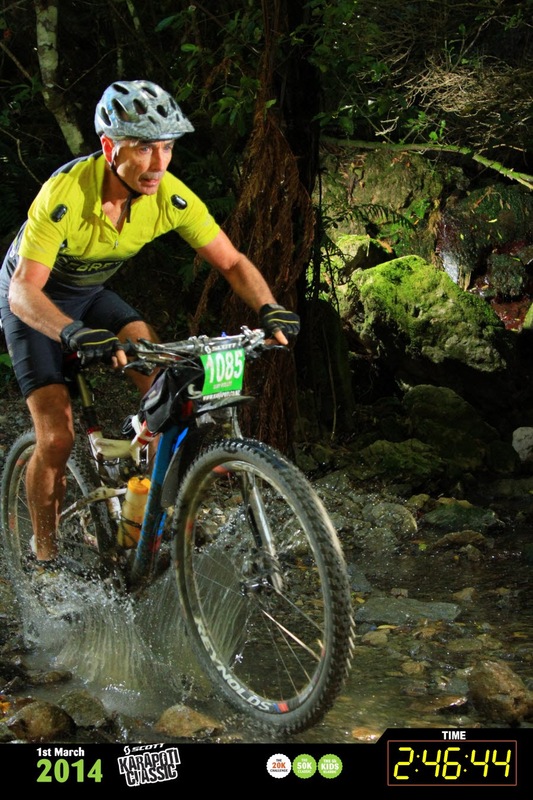 As with most of my previous Karapoti races, I just hope the course does not have the final say - crashes, punctures, mechanical failures, or simply disappearing in one of its infamous bogs! A who’s-who of New Zealand mountain biking will go head to head in Upper Hutt on Saturday as more than 700 riders from eight countries line up for the Scott Karapoti Classic. Twenty eight years ago 45 hardy souls lined up in Upper Hutt’s Akatarawa Ranges for New Zealand’s first annual mountain bike race. Almost 30 years later, more than 700 riders from eight countries and all ends of New Zealand will line up for what has become the Southern Hemisphere’s longest running mountain bike event.